A fan-cuiled heat sink on the processor o a personal computer. Tae the richt is a smawer heat sink cuilin anither integratit circuit o the mitherbuitd. 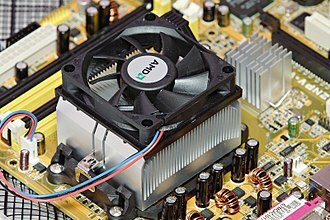 A heat sink (an aa commonly spelled heatsink) is a passive heat excheenger that transfers the heat generatit bi an electronic or a mechanical device tae a fluid medium, eften air or a liquid cuilant, whaur it is dissipatit awey frae the device, tharebi allouin regulation o the device's temperatur at optimal levels. ↑ "GlacialTech announces Igloo FS125S 30W cold forged pin fin heatsink". Eco-Business. Retrieved 2016-01-19. This page wis last eeditit on 2 November 2017, at 21:17.